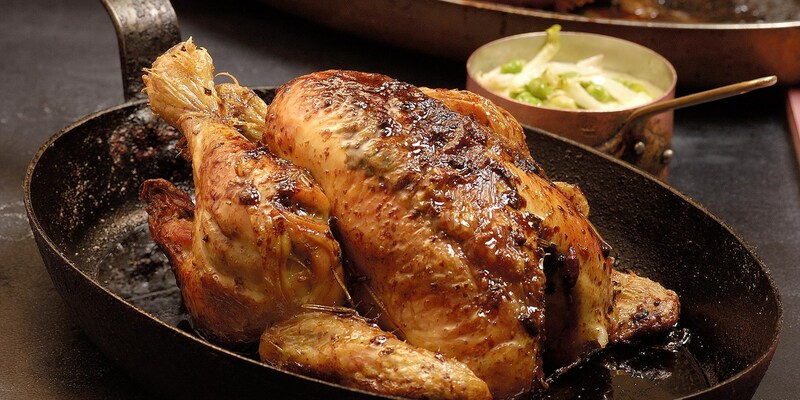 Roast chicken is the little black dress of the culinary world, humble enough for a midweek roast served with mashed potato or salad but easily dressed up for a Sunday lunch with roast potatoes, Yorkshire puddings and other tasty trimmings. It's also a fantastic investment of both money and time in terms of leftovers; the bones can be put to good use making a fragrant chicken stock and any meat can form the basis of a hearty soup, stew or pie. Browse this collection of roast chicken recipes for tips on achieving perfectly cooked meat every time. Graham Campbell serves his roasted chicken with a chunky potato salad making the perfect Sunday lunch recipe for the summer months, while Martin Wishart pairs more autumnal flavours of apple, root vegetables and cider to create a fantastically simple pot roast recipe. For a perfectly golden bird with juicy, flavour-packed flesh Paul Heathcote's roast chicken recipe truly delivers, with a creamy mix of herbs, butter and a little cream cheese rubbed under the skin of the chicken before roasting to baste the bird from the inside.